This Grundfos SQFLex is an industry-leading submersible pump for water lifts of up to 800'. With the proper controller, SQFlex pumps can be directly powered by solar or wind or can be run on an inverter, a generator, a battery, the utility grid, or any combination of these sources. 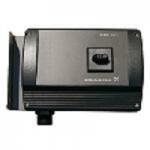 Virtually any source of power, 30 to 300 VDC and 90 to 240 VAC, can be used to run this pump. It can operate on a series string of PV modules with a total peak power voltage of at least 30 VDC, but its efficiency will be highest at voltages over 100 VDC (10% less efficient at 60 VDC, and 20% less efficient at 35 VDC). Its motor is designed to draw a maximum of 8.4 A, which means that many types of PV modules can be used with this pump efficiently, including common 60 cell modules. SQFlex models 3SQF through 11SQF will fit into a 3" well and models 16SQF-10 through 60SQF3 will fit into a 4" well. The 11 different pump models available can deliver from 82 gpm at 6' of head to 4 gpm at 800' with a 1.6 kW or smaller solar array. Use the helical rotor pumps (models 3, 6 and 11) for high head applications and centrifugal pumps (models 16, 25, 40, and 60) for low head applications for best efficiency. The SQFlex has built-in protection from dry-running, overloading, and overheating. The Whisper 200-120 V wind generator can be connected directly to a SQFlex pump. 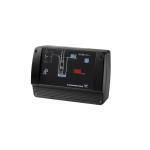 Use the Grundfos IO-102 Wind interface in place of the Whisper 200 Controller. SQFlex pumps have a 2-year warranty from the date of purchase. A 5-year extended warranty is available. SQFlex controls can be combined if you need more features than one control can provide. 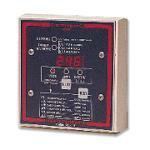 The CU200 interface box communicates with the pump and monitors operating conditions. Built-in diagnostics indicate faults and dry-running, as well as display operating status, power consumption and water level switch input. The Water Level Switch interfaces with the CU200 control to turn off the pump when the tank is full. Since the CU200 control circuit uses only 15 mA, the water level switch can be located in a tank as far away as 1,640' from the pump, using a minimum #18 AWG 2-conductor wire. (see Wire and Cable.) 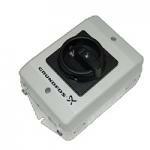 The CU200 is covered by a standard 2-year warranty. The IO50 control box includes cable terminations and a manual on/off switch that interfaces between a solar array and the pump to allow you to turn off the high voltage array when servicing the pump or plumbing. 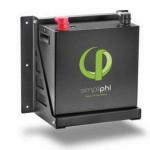 The IO101 AC interface box is for using AC backup on a solar pump. An automatic transfer switch disconnects the solar array when AC power from a generator (120 VAC only), utility connection, or inverter is present. When AC power stops, it automatically reconnects the array to let the sun continue pumping. The SQFlex pumps will not function with a GFCI in the supply circuit, and should not be used where a GFCI is required. 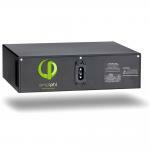 The IO102 interface unit is used for systems powered exclusively by a wind turbine or by a combination of wind and PV. 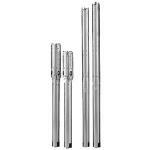 Grundfos Solar Water Pumping Kit 5.5 gpm 750w up to 330 feet head.